Lately, I’ve been making my own vegetable stock on the weekends. I’m normally a chicken broth kind of girl – it serves me so well whenever a little extra liquid and extra flavor are needed, and there are several decent varieties for purchase in most grocery stores these days. Yeah, yeah, it’s wonderful to make your own chicken stock, but I don’t always have time to deal with it, and it’s one of those areas where I feel the store-bought version is good enough to justify the shortcut. Sue me. But I’ve been trying to make more vegetable soups over the past few months, and they aren’t always conducive to chicken broth’s different melody. Sadly, I have yet to find a prepackaged vegetable broth that didn’t taste smurfy. I can’t put my finger on what I find specifically objectionable about the taste, but it’s just…off. It tastes like something completely wrong swam around in the pot for a bit while the flavors were mingling. A frog? A tuba? 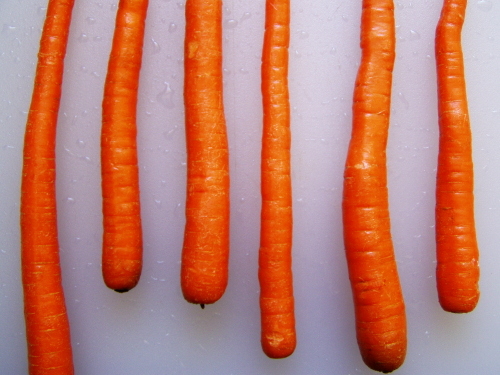 A mirepoix of tires and potato peels? Something totally weird. Unlike chicken stock, which really wants several hours to simmer and amuse itself, homemade vegetable stock takes about 90 minutes, including chopping. It’s a true ensemble cast, too. Leeks, carrots, mushrooms, fennel, onions, tomatoes – all coordinate themselves together gracefully to produce a smooth, sweet, silky broth. No single element charges to the footlights to demand your attention. It doesn’t taste like fennel. 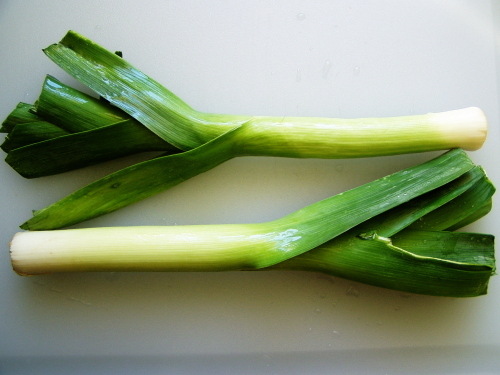 It doesn’t taste like leeks. It tastes like a beautiful prelude to the fluttery melody that will come with the rest of the ingredients. 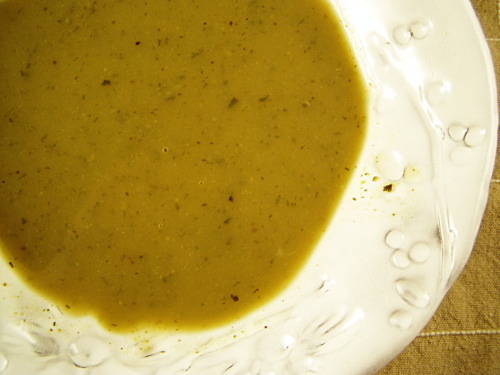 I had a pint of stunning roasted zucchini soup for lunch the other day. The restaurant in my office building has a take-out kiosk on the patio, and I often snag a quick lunch from them when I’m too lazy to pack something in the morning. The food there has gotten markedly better in the past three years, most notably the soups. 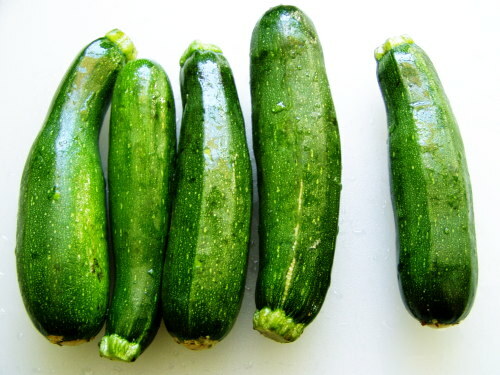 This little roasted zucchini number was extremely simple – a delicate puree brightened with dill. It’s a good thing I like to keep my door closed when I eat at my desk, because nothing about the way I dove into that soup matched the delicacy of its gentle flavors. I scarfed. 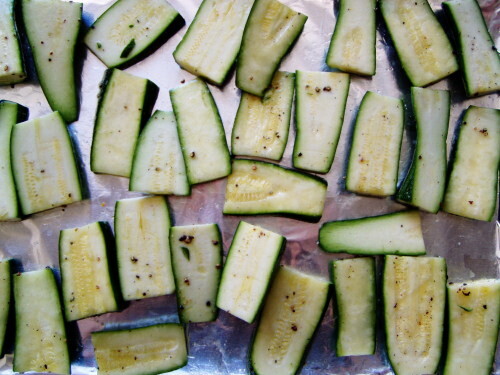 And promptly added zucchini to my shopping list so that I could make my own. While the homemade stock isn’t life-and-death critical here, I really recommend you give it a shot. 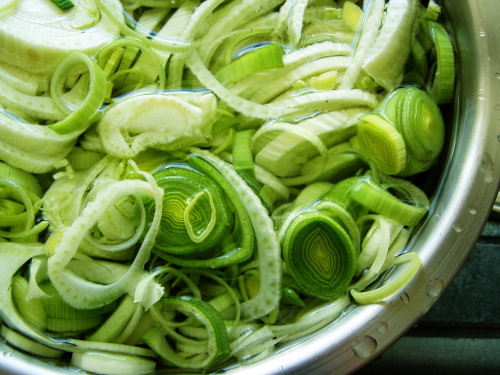 The stock can simmer while the zucchini roasts, so you aren’t adding much time to the whole venture. Let the pot on the stove and the tray in the oven do their thing while you amuse yourself with other stuff and before you know it, you’ll have everything ready for the final simmer. About the color. 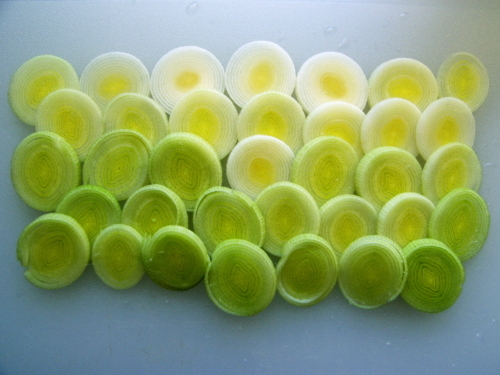 It’s not exactly the most beautiful soup you’ll ever see. I know. If you must, take a slurp with your eyes closed. Let it roll over your tongue and warm your belly, and see if it doesn’t look ever so much lovelier when you open your eyes again. P.S. Like the third photo above? It’s called Simple Greens, and if you would be so kind, I would greatly appreciate a “yeah” vote in the Color Theory competition at JPG Magazine. Thanks! The Salty Spoon is powered by	WordPress 2.7 and delivered to you in 0.176 seconds using 23 queries.